Atlantis Slots is a classic 3 reels 1 payline video game created by Microgaming. It invites you into the magic world of deep blue ocean that can present you the top jackpot of 1,600 coins. 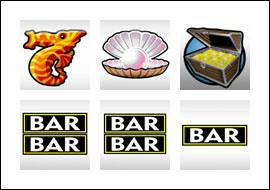 Such colourful icons as Oyster, Sea Horse, Treasure Chest, Single Bar, Double Bar, Triple Bar offer you to search for treasure and win some impressive prize. You can choose among such coin sizes as $0.25, $0.5, $1, $2, $5.00. You should play with 2 coins to get the maximum award of this game. In other words, the minimum bet that allows you to win the top jackpot is $0.50 while the maximum bet of this game is $10.00. The highest jackpot is 1,600 coins or $8,000 for 3 Treasure Chest if you bet 2 coins per line. The second jackpot is 800 coins or $4,000 for 3 Treasure Chest if you bet 1 coin per line. 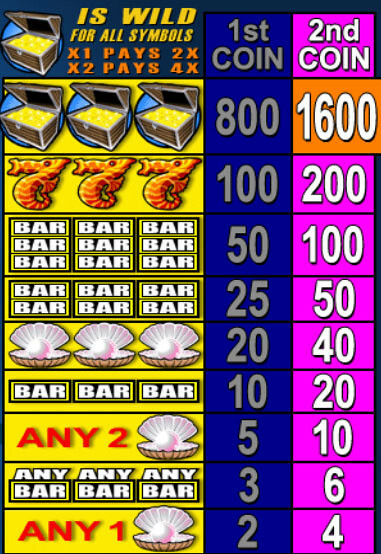 The third highest jackpot is 200 coins or $1,000 for 3 Sea Horse if you bet 2 coins per line. Treasure Chest is the wild symbol. It can substitute any other icon except the scatter to produce more winning combinations for you. What is more this symbol double your winnings in case you get 1 Treasure Chest in winning combination and quadruple your award if you get 2 Treasure Chest icons in winning combination. In other words, you can get 800 coins or $4,000 for 1 Sea Horse with 2 Treasure Chest instead of 200 coins or $1,000 for 3 Sea Horse. 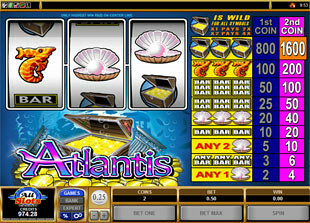 Atlantis slot machine is a simple game with traditional icons and quite attractive prizes. Enjoy gentle breeze and try to win the best. Playing this simple, but still bright game you can win really amazing prizes. So, don’t waste your time and dive into this undersea world where gentle waters can reveal incredible treasures for you.